IF YOU HAVE AN Automotive ACCIDENT, WE ARE HERE TO HELP YOU THROUGH THE PROCESS IN A FAST AND FRIENDLY MANNER. 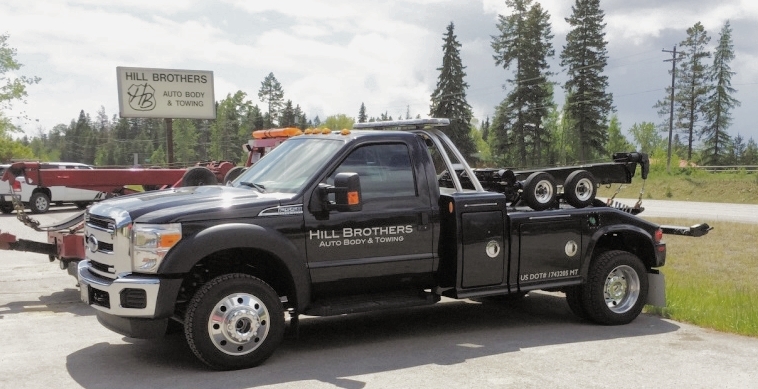 HILL BROTHERS AUTO BODY & TOWING - A COLLISION REPAIR SHOP AND TOWING SERVICE LOCATED IN WHITEFISH, MONTANA. Besides fixing cars, the real life Hill Brothers have and continue, as did their parents, to volunteer countless hours coaching baseball and boxing in the Flathead. They support many local fundraisers, causes, and sports programs around the valley. In 2008, The Whitefish Chamber of Commerce honored Bill, Gene, and Joe Hill with the Youth Activities Volunteers of the Year Award. An award that their parents, Rusty and JoAnn Hill, received decades earlier. Hill Brothers was awarded the 2015 Bulldog Booster Award for outstanding contributions to WHS Activities as well as the 2015 Best of the Flathead Best Towing Service Award. Quality work, competitive pricing, and friendly, honest service is what Hill Brothers Auto Body has to offer. We provide a comfortable waiting area for you to relax while we prepare your free estimate. Whether your repair cost is covered by your auto insurance or out of pocket, we will get you back on the road! We want the repair process of your vehicle to be as stress free as possible. That's why we work with all insurance companies and deal with them direct after you make your initial auto claim. You have the right to choose your repair shop, and if you select us, we are honored to provide quality auto collision repair to you, our customer! Cracked Windshield? We can help with quality windshield replacement. Hill Brothers is able to order and install accessories to your vehicle such as running boards, vent shades, and brush guards. Just express your thoughts during the estimating process with us. Quality collision repair is a standard here at Hill Brothers Auto Body. We want your vehicle to be returned to you good as new, if not better than before you had an accident. You are in good hands when you hand over your keys at Hill Brothers. 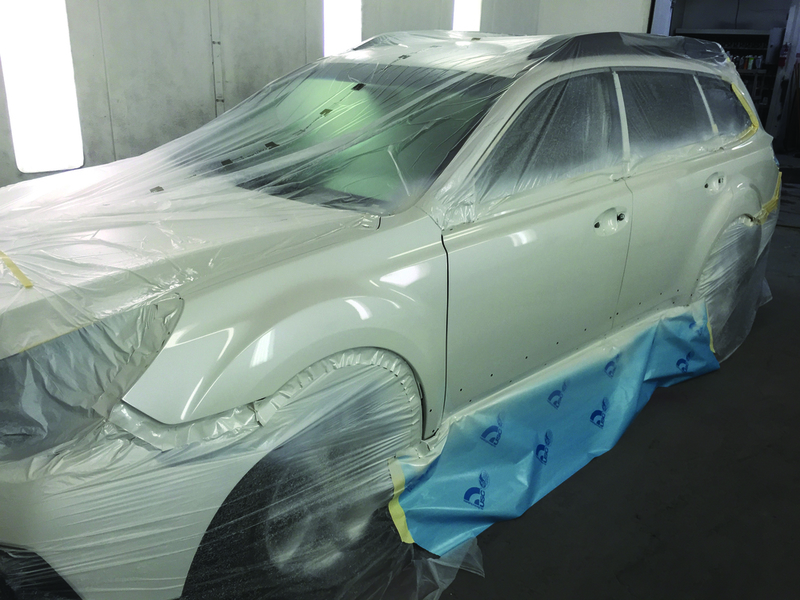 Our paint technicians use quality equipment and supplies to refinish your vehicle. We use an environment friendly automotive paint system. Hill Brothers also offers around the clock, valley wide towing service, 24 hours service to be exact. Our friendly and competent tow truck operators are also available for jump-starts, lockouts, and flat tire assistance. With multiple trucks and operators, Hill Brothers Towing is always available. Just call and we will gladly help you. Was in Whitefish visiting family and hit a deer with my Forester. The hood wouldn’t close and coolant was leaking. I called Hill Brothers and they had me come right over. They made a quick temporary fix of both the hood latch and the coolant leak so I could get my car home for a permanent fix. Current job openings are listed below. Please send resumes here, or drop them off at our office. Hill Brothers Auto Body & Towing is seeking a Paint Prep Tech for full time employment in Whitefish, MT. A great way to get started in the auto body industry! No experience, no problem! We are willing to train. Experienced techs welcome too! Job duties will include but not limited to: interior/exterior cleaning of cars, sanding/preparing vehicles and parts for paint; and general shop clean up. Full time employment position, Mondays - Fridays, 8am - 5pm, hourly wages DOE. Benefits after one year include: Paid week vacation, paid holidays, employer simple IRA match. Applicant may send resume via email or drop it off at our office. Hill Brothers Auto Body & Towing is seeking an experienced Collision Repair Tech for full time employment in Whitefish, MT. 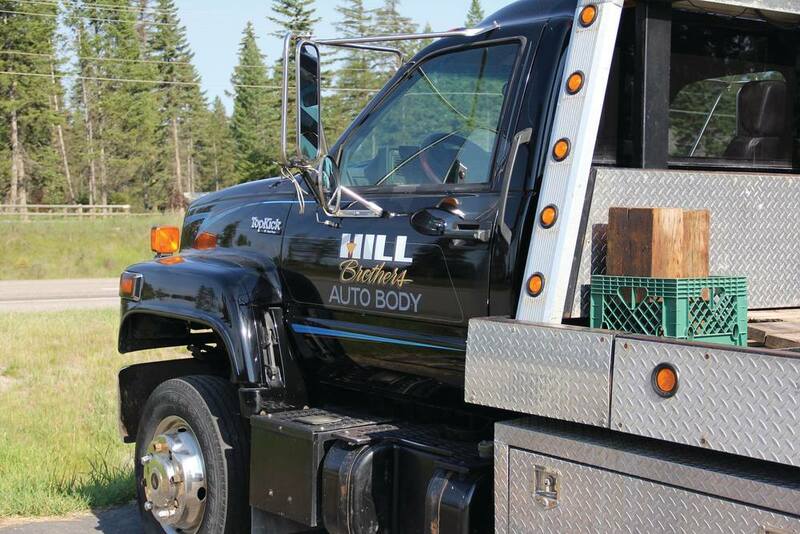 Hill Brothers Auto Body & Towing is seeking a Tow Truck Driver for full time employment in Whitefish, MT. Applicant must provide excellent roadside customer service. Mechanical knowledge of vehicles is also a plus. Job duties include but not limited to: maintaining tow related paperwork and equipment; operating light duty tow trucks and flatbeds; jumpstarts; tire changes; lock outs; and vehicle transportation. Full time employment position, hourly plus commission wage pay DOE.